Click the image to the left. Each fragment will link to a different part of my site. I'm trying to experiment with hyperlinks & hotspots. 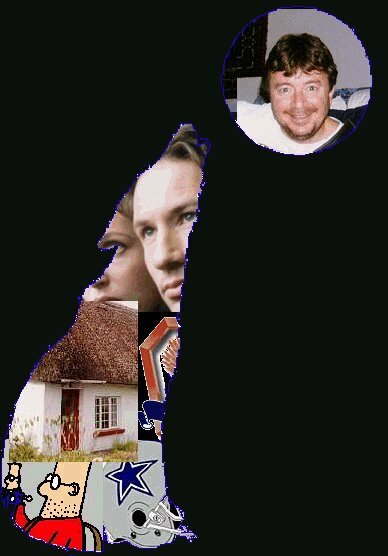 Other links in the picture are (clockwise from the top) - X-Files, Grange, Dallas Cowboys, Favorite Links, & vacation photos. Check out www.Hotmail.com, www.Yahoo.com & www.tripod.com for free internet services like email & home pages. If you'd like your own home page, check out Tripod. They give free home pages & let you store up to 50 MB for free! It's a great deal. Visit their site at http://www.tripod.com/. We've also just signed up far an Internet account through Globalnet ISP services. They are local to the Essex junction/Burlington, VT area. They are really inexpensive & very friendly. They are small enough to give you personal service, but they have 56 K lines as well, for faster home access. Check them out at http://www.globalnetisp.net/. You are visitor to our site. Welcome!